We deeply regret that this positive, life-changing evening will be postponed until EARLY 2015 – date to be advised. 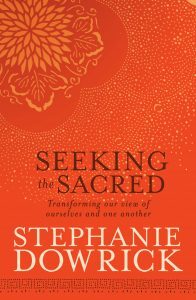 All events are announced via Stephanie’s Facebook page, or join the Universal Heart Network (details for both on this website). 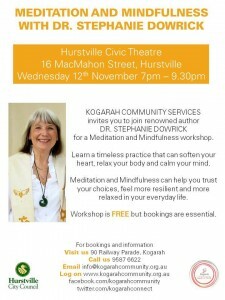 Kogarah Community Services are hosting a FREE evening on Wednesday 12 November, 7-9.30pm (bookings absolutely essential) with Dr Stephanie Dowrick on Mindfulness and Meditation: two essential practices for maintaining a more confident and spacious, less anxious, time-driven way of living. Please call to reserve your seat for an evening that in a gentle, approachable way can bring greater ease and happiness to your daily life. Telephone: 02 9587 6622. The event will be held at Hurstville Civic Theatre, 16 MacMahon Street, Hurstville. Previous Previous post: Big issues; Great thinkers. Why non-violence is essential.